Edible centerpieces combine whimsey with beauty, practicality with palate appeal. 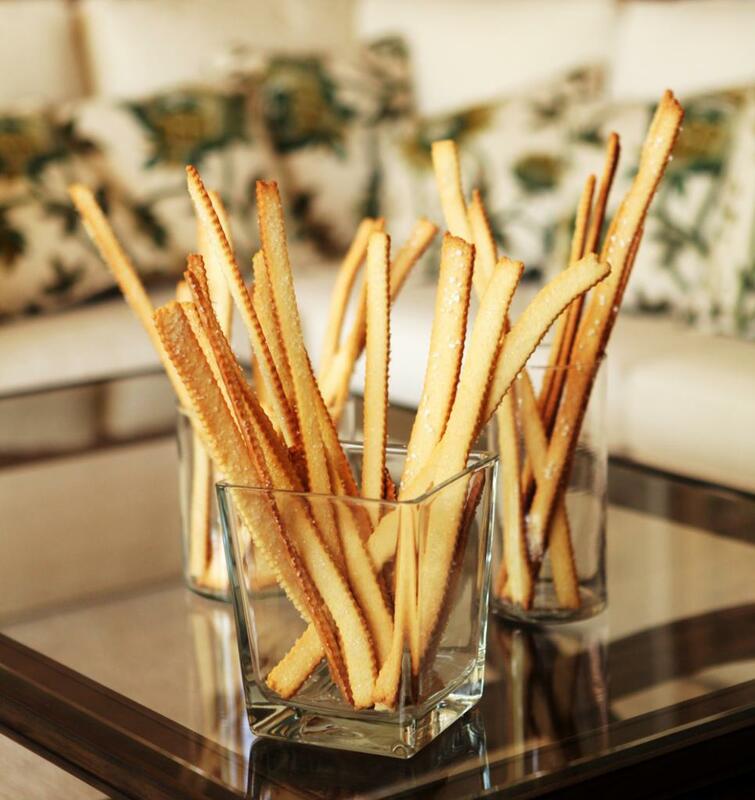 Award-winning pastry chef Elyssa Fournier uses her crisp, buttery shortbread sticks to make delectable tabletop art. 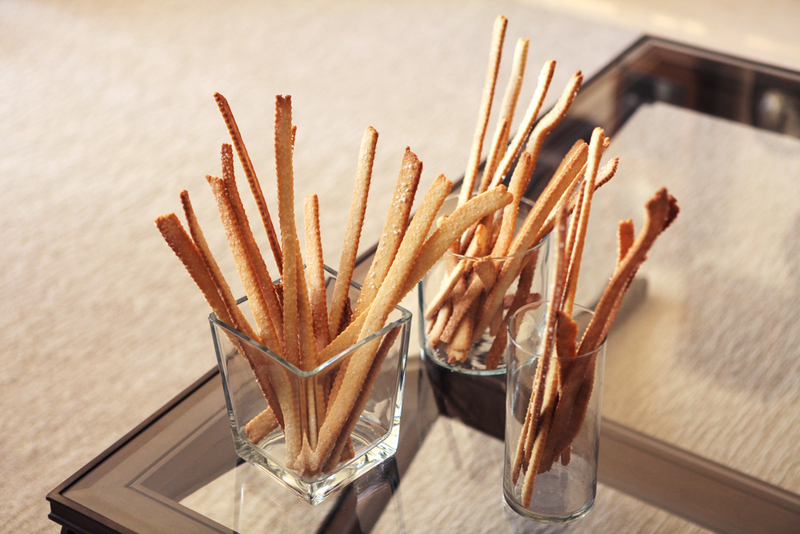 Cut into long, zigzag-edged stalks, they stand tall in assorted cylindrical vases. Fournier is the owner of the home-based Mixed Bakery in Corona del Mar. She varies the color of the crystal sugar that adorns the surface to match the theme of the event. Green, gold, and brown for Thanksgiving. Perhaps red and pink for Valentine’s Day. But she says that colored sugar is about as Martha Stewart as she gets. I don’t see it that way. I’m sure Martha would be impressed by the visual appeal and irresistible taste and texture of her delicacies. No doubt the wow factor in every slice of her chocolate saucisson would win Martha over; it’s a salami look-alike that is made with chocolate, nuts, and dried fruit. Her banana chocolate-chip muffins and magical fruit-centric tarts are winners, too. Fournier says baking is in her blood. Her Prussian grandfather and father were bakers in Brooklyn and Long Beach, New York. In her early college days, she was studying to become an entomologist. Spider photos mixed with pastry photos on her cellphone. Long hours of science lab work squelched her spider love, and she turned her talents to baking. A storefront location is a dream of hers with her husband, chef Yves Fournier. She says it feels like they are getting close to making it a reality. The spot will feature breakfast, lunch, and pastries, as well as occasional special dinners. 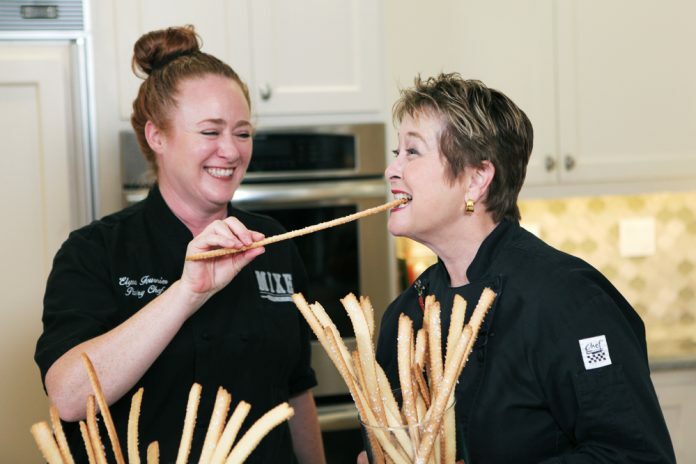 OC eats: Her favorites include Tustin’s Cream Pan for their cheese boules, baguettes, and croissants. And Costa Mesa’s Din Tai Fung for the flavors she craves, especially the Shanghai Rice Cakes with Pork. Favorite tool: A small offset spatula is a must. She uses it to spread batters or frostings. It’s also handy for picking up dough. She has larger ones but seldom uses them. Best veg: Favorite vegetables are carrots in cake. Collections: She accumulates rolling pins and aluminum platters from the ’50s. Best baking advice: Bake everything really dark—well done. Cook’s notes: To make the butter very cold, cut it into small pieces and place in freezer for 10 minutes. Pearl sugar is very coarse sugar that is hard, opaque white, and does not melt at temperatures typically used for baking. The product usually is made by crushing blocks of white sugar, then sifting to obtain same-sized fragments. Adjust oven rack to middle position. Preheat oven to 350 degrees. Line 2 or 3 baking sheets with parchment paper. Mix all dry ingredients together in large bowl of electric mixer. Add cold butter pieces to dry ingredients; mix with paddle attachment (starting on low speed) until it resembles breadcrumbs. Add in eggs and vanilla. Mix until combined and starting to form a dough. Dust clean, dry work surface with flour. Working with about 1/3 of dough, knead until smooth on floured surface. If it is sticky, refrigerate it in zipper-style plastic bag for 20 minutes. 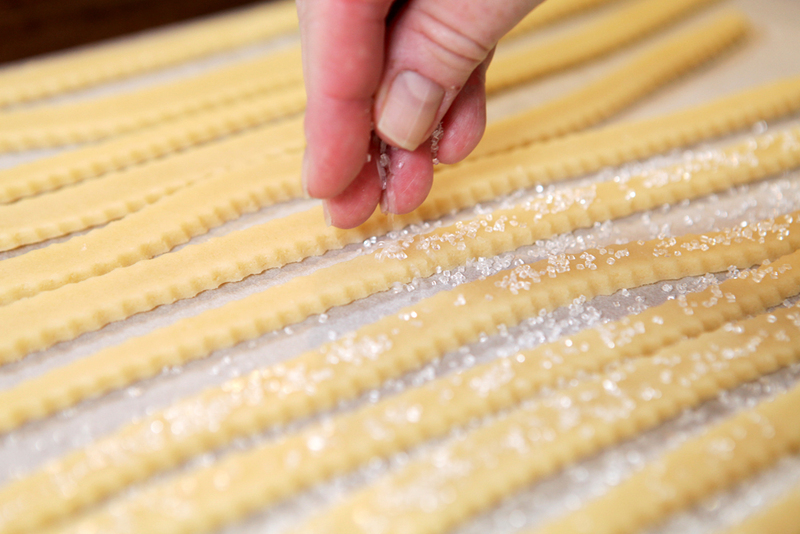 If it isn’t sticky (or if it has been chilled), roll out on lightly floured surface until 1/4-inch thick. Cut into sticks about 5/8-inch wide using a fluted wheel cutter and place in single layer on parchment lined baking sheets. It’s fine if some are slightly curved rather than straight. Lightly sprinkle with crystal sugar (and pearl sugar if you like). Bake until golden brown, about 14 to 18 minutes (she prefers them well browned). Cool on baking sheets. Repeat with remaining dough. Can be stored airtight up to 1 week. Place, one by one, in tall glass cylindrical vases of varying heights and use as a centerpiece.